It was another record-breaking year for membership across the game in 2016. 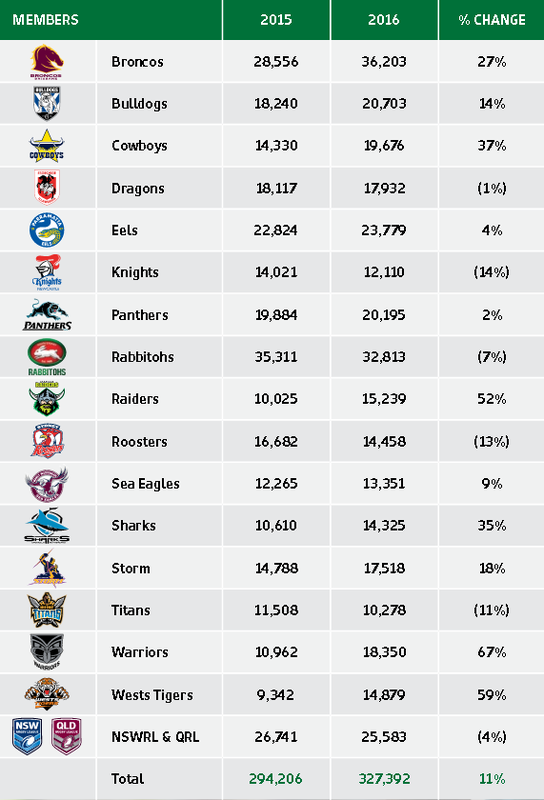 For the first time in the game’s history, there were more than 10,000 members for each of the 16 NRL Clubs. Membership grew by 11 per cent to 327,392 loyal and passionate registered members. The Brisbane Broncos matched their strong on-field performances by delivering a new membership record of more than 36,000 members – up 27 per cent on the previous year. The Clubs recording the biggest increases in memberships were the Warriors (67 per cent), Tigers (59 per cent), Raiders (52 per cent), Cowboys (37 per cent) and Sharks (35 per cent).